Forget heavy, expensive lithium-ion batteries, the next generation of eco-vehicles could be using alcohol-powered fuel cells. Scientists at the US Department of Energy's (DOE) Brookhaven National Laboratory have developed a new nanotechnology catalyst that could make booze-powered fuel cells possible for the first time. 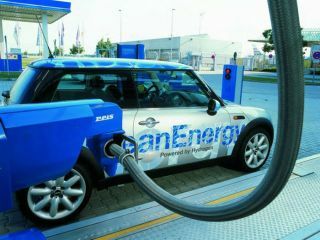 Fuel cells convert hydrogen and oxygen into water, producing an electric current in the process. However, hydrogen is difficult to store and explosively dangerous transport in many forms. As an alternative, hydrogen-rich compounds like ethanol - basically, pure alcohol - can be oxidised into the hydrogen ions and electrons that are needed to generate electricity. Up until now, though, scientists have been unable to find a catalyst capable of breaking the bonds between ethanol's carbon atoms efficiently. The DOE's breakthrough was developing an electrocatalyst, made from platinum and rhodium atoms on carbon-supported tin dioxide nanoparticles, that can break carbon bonds at room temperature. Carbon dioxide is the only by-product of the process. "Ethanol is easy to produce, renewable, nontoxic, relatively easy to transport and has a high energy density," said Brookhaven Chemist Radoslav Adzic. "In addition, with some alterations, we could reuse the infrastructure that's currently in place to store and distribute petrol." Just imagine it: in a few years, forecourt pumps could be dispensing pure alcohol to eco-friendly motorists. But remember, it's strictly for driving, not drinking (pure ethanol can kill).